The diagrams below show the development of a small fishing village and its surrounding area into a large European tourist resort. 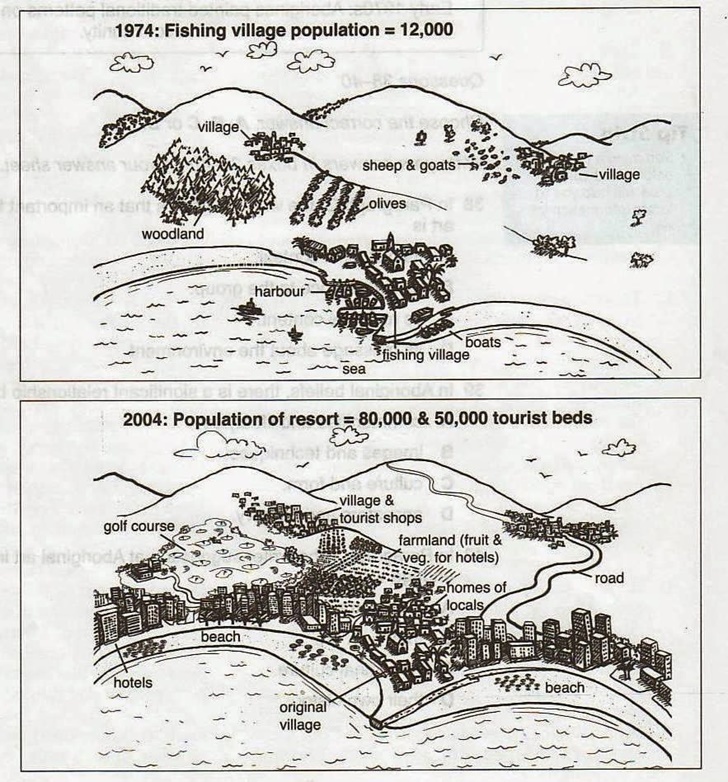 The diagrams illustrate the tranformation of a small fishing village and areas around it into a large tourist resort in Europe from 1974 to 2004. Overall, it is evident that the infrastructure for housing and recreation have increased sharply at the expense of farmland, woodland and available land surrounding fishing village. One of the notable changes was that the disappearance of woodland made way for the construction of the golf course. There was a replacement of the olive field, which was located behind the fishing village, by the farmland to plant vegetable and fruit for hotels nearby while the harbor was replaced by a beach. The available land waterfront has disappeared to give way to the emergence of variety of hotels. The village on the left side of fishing village had more houses and a number of tourist shops while in the village on the right side of fishing village, the land for livestock has been replaced by housing infrastructure and there are a new constructed route that connected this village with the original one. The diagrams (drawings) illustrate the tranformation of a small fishing village and areas around it in 1974 into a large tourist resort in Europe in from 1974 to 2004. Overall, it is evident that (Those words do not describe the graphic.) the infrastructure for housing and recreation have increased sharply at the expense of farmland, woodland and available land surrounding the fishing village. One of the notable changes was that The disappearance of woodland made way for the construction of the golf course. There was a replacement of the olive grove field, which was located behind the fishing village, by the farmland to plant vegetable (wrong form) and fruit for hotels nearby while the harbor was replaced by a beach. The available land on the waterfront has disappeared to give way to the emergence of variety of hotels. The drawings illustrate the tranformation of a small fishing village and areas around it in 1974 into a large tourist resort in Europe in 2004. Overall, the infrastructure for housing and recreation increased sharply at the expense of farmland, woodland and available land surrounding the fishing village. The disappearance of woodland made way for the construction of the golf course. There was a replacement of the olive grove , which was located behind the fishing village, by the farmland to plant vegetables and fruit for hotels nearby while a harbor was replaced by a beach. The available land on the waterfront has disappeared to give way to the emergence of variety of hotels. The village behind the woodland and olive grove had more houses and a number of tourist shops while in the other village up in the hills, the land for livestock has been replaced by more houses and there are a new constructed route that connected this village with the original village. The drawings illustrate the tranformation (Check this word in your dictionary.) of a small fishing village and areas around it in 1974 into a large tourist resort in Europe in 2004. Overall, the infrastructure for (Infrastructure consists of roads, bridges, sewage systems, water supplies, street lighting, fiber optic or copper cables for communication, cell towers, and similar supporting structures. Is that what you mean?) housing and recreation increased sharply (wrong word) at the expense of farmland, woodland and available land surrounding the fishing village. The village behind the woodland and olive grove had more houses and a number of tourist shops while in the other village up in the hills, the land for livestock has been replaced by more houses and there are a new constructed route that connected this village with the original fishing village. The drawings show the development of a small fishing village of 12,000 inhabitants and two nearby farming villages in 1974 into a large tourist resort area with the capacity of accommodating 80,000 tourists. All the signs of the former occupations and lives of the villagers - a village church, fishing harbor, pastures for sheep and goats, and an olive grove - have gone by 2004. In their place are recreational facilities typical of seaside resorts such as a main highway, high-rise hotels, a golf course, shopping areas, beaches, and a large plot of land to grow fresh fruits and vegetables for the visitors.